How to make Chicken Biryani in a Pressure cooker. Use your Pressure cooker to make this gorgeous, delectable one-pot Chicken Biryani for any festive occasion including Ramadan. It’s quicker, full of flavour and the best meal to feast with your family. Biryani, a mix of rice and meat, spices galore cooked in layers of meat and rice. And a pressure cooker makes the whole process easier and cuts the cooking time in half while helping to preserve the flavours of what you expect in a restaurant-styler under a tight lid. Making any type of Biryani can be a daunting prospect for anyone, even a seasoned cook unless you make biryani for a living. The whole process of making a good pot of Biryani needs to be done with patience and attention to the ingredients you are using. Keeping this in mind I written this recipe post so you can make an easy biryani for the whole family using your pressure cooker. 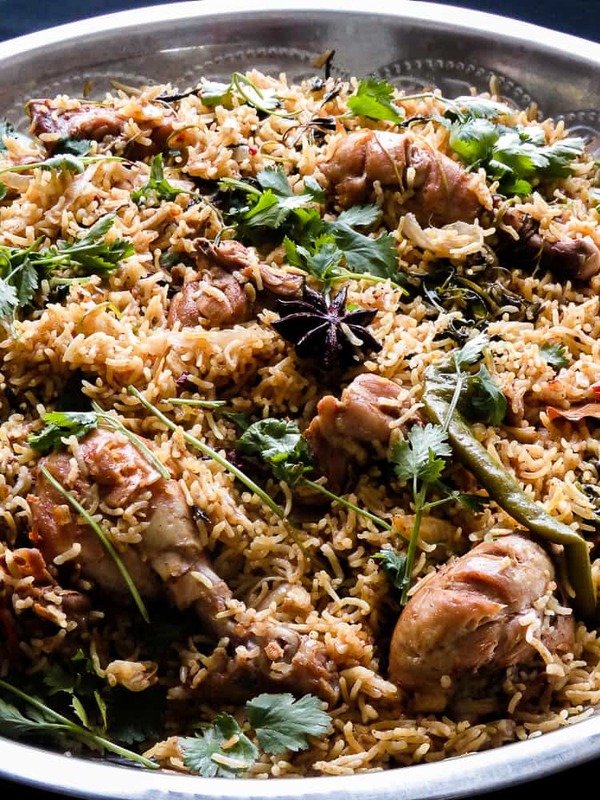 If you are a first-time Biryani maker then read this. Making a biryani for the first time, you might feel the steps are too complicated, takes too much time or there are too many spices involved. The thing is, at some point you’ll be entertaining a crowd or a few family members and knowing how to make biryani using a pressure cooker can save you time and the hassle of preparing a big spread. Don’t try to make a biryani the first time when you are going to have guests the same day, chances are you might make a few mistakes like the rice not being cooked through or overcooked. To avoid these issues, try cooking the dish a few times at home for your own family. The lesson I’ve learnt is that you get better at making the dish once you’ve made it a few times. 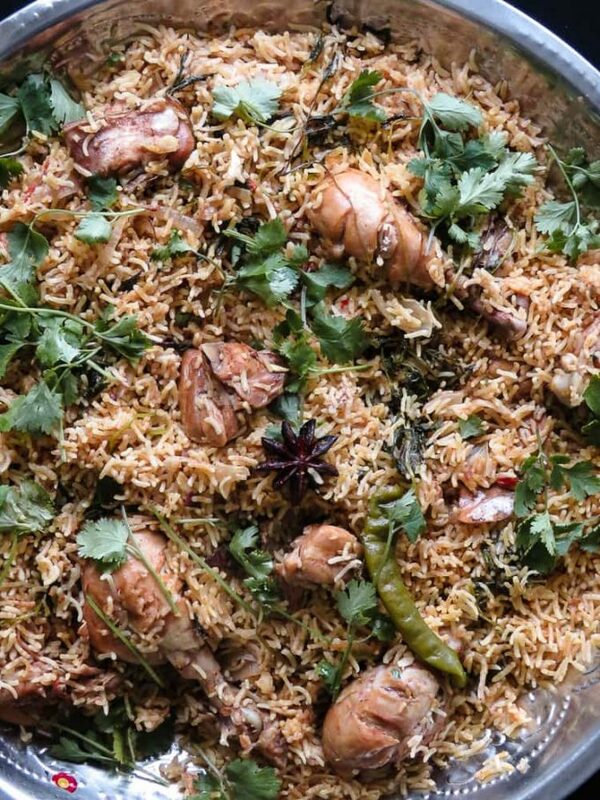 Fridays and Sunday special lunches are great opportunities for you to try this recipe as the Chicken Biryani is an all in one meal. You’ll even know what to do if there isn’t enough seasoning. so make sure to spend a few Sunday lunches creating the dish and you’ll be able to dish out a Biryani you can be proud of. Why you should make biryani in a pressure cooker. If you’ve never owned a pressure cooker then this is your opportunity to go buy one, I know it’s an expensive kitchen appliance to invest in but the longevity and uses of it are worth the investment. Once you’ve read the safety details, you’ll be more than ready to dish out tasty dishes fast. Advantages of using a pressure cooker. 1/ Its’ economical as the cooking process takes less time to cook, especially poultry and meat. 2/Saves energy, whether you’re using stove-top or the electric version, it still saves a lot of energy and gas. 3/cooking with a pressure cooker also preserves most of the nutrients in the ingredients you use to prepare a meal. 4/because you use less liquid, the flavours are enhanced. A Chicken Biryani that took me an hour to cook. It’s an effortless meal that you can create if you follow my step-by-step instructions given in the recipe. I’ve tried to include all the nitty-gritty details so you can get the same results. To be fair, I do tend to be a whirlwind in the kitchen, if you are cooking the Biryani for the first time give an extra 30 minutes but once you’ve cooked the dish a few times then yes. Follow the steps as exactly as I’ve mentioned and you can. Using a pressure cooker really does cut down the cooking time. What about the chicken, is 30 minutes enough time for the chicken to absorb the marinade for the biryani? Yes, I mean, you can pre-plan and do the marination a few hours earlier but if you are really desperate for time and need the meal on the table in a rush, then 30 minutes should give the marinade enough time to flavour the chicken. Again the pressure cooker helps to lock in the flavour and do its magic. Not if you follow my recipe instructions and read the notes carefully, what I’m going to give you is a step-by-step method from the smallest details to get the dish done efficiently. The key to a good pressure cooker biryani is having a 6-8 litre pressure cooker and making sure that all the spices are fresh. If you want a full-flavoured Biryani then have all the ingredients mentioned here on hand. You can confuse Cumin seeds with Caraway seeds or the other way round as they look the same but Caraway seeds are curved and have a more minty tone to it so try not to confuse the two. Appliances and utensils you will need. 6-8 litre pressure cooker and a large flat platter to transfer the cooked biryani. Tips to make the pressure cooker biryani. The following recipe ingredients have three components that need to be prepared for the Biryani to be assembled smoothly. Make sure to keep all the ingredients ready. You can easily make the ginger garlic paste by pounding both ingredients. when it comes to Garam masala, I would recommend using a store-bought version for convenience. IMPORTANT- I can’t stress enough how vital it is to get the Biryani off the pressure cooker once it’s cooked. keep a large, platter so that the rice doesn’t overcook with the remaining heat. so have one ready. Please make sure to read the recipe instructions carefully at least once to avoid mistakes. Remove extra fat off the chicken and cut them into required size, leave the legs as they are. Make deep slashes on them so they absorb the marinade. Place the chicken in a large bowl, add Curd, Ginger-garlic paste, Turmeric, red chilli powder and garam masala with Salt to season. Mix all the ingredients well into the chicken, cover and set aside for 30 minutes to 1 hour(an hour or two would be preferable). Refrigerate the chicken if marinating time exceeds 30 minutes. Once the chicken parts are marinated, remove from refrigerator and let it come to room temperature. Meanwhile, wash the Basmati and soak for 10-15 minutes. Place the pressure cooker pan over medium heat and pour in the oil. let the oil heat for 1 minute then add the tempering spices(Bay leaves, green Cardamoms, cloves Cinnamon stick, Star anise, Caraway seeds). Cook the spices for 1-2 minutes or until they sizzle. Add green chillies and the sliced Onions, sauté until translucent, 3-4 minutes. include the ginger-garlic paste and fry over medium heat for a further 3 minutes. Once the above ingredients are sautéed and turn slightly brown, it’s time to introduce the chicken to the spices. Place the chicken parts closely in the pressure cooker and slightly fry the chicken, turning the meat constantly so they cook evenly over medium-high to high heat. This should take a minimum of 10 minutes. Should you find that the chicken not browning due to liquid from the curd, then just continue cooking until there is less liquid. Once the chicken is fried, add the Yoghurt, Tomatoes, Garam masala, red chilli powder and mix all the ingredients well. Cook for 5-10 minutes over medium heat. Then add a layer of Coriander and Mint leaves, let the ingredients cook, making sure that there is little liquid left at the bottom. Once the chicken is cooked until there is a minimum amount of liquid. Pour in the water in the pressure cooker, season with salt and increase heat to bring the water to a boil. Once the water is boiled, reduce heat to medium and add the drained Basmati rice to the pressure cooker. Make sure the rice is completely submerged in water then cook until water is completely reduced. check if the liquid is sufficiently seasoned with Salt. Once water is reduced, cover the pressure cooker with its lid and cook for 3-5 minutes or stop just before the first whistle blows. Take the pressure cooker off the stove, give about 2 minutes for the rice to further cook(I usually count up to 60)then release heat by lifting the pressure regulator with a wooden spoon and let the steam off completely. Take the lid off and immediately transfer the Biryani to the large platter in hand and spread evenly, the remaining heat would take care of cooking the rice to the right soft texture. Instead of drizzling the ghee on top of the rice, pour it into the pressure cooker while scraping off the browned bits from the pan, this is the good stuff, once this is done, slightly warm it and THEN drizzle the ghee with the browned spices on to the biryani, then using two forks fluff the rice gently, garnish with Coriander leaves and serve warm. 7-9 pieces of chicken( a mix of legs, breast and thighs cut into right size when you are cutting the chicken keep the size of the pressure cooker in mind).